4 Bedroom Detached Bungalow For Sale in Bungay for Guide Price £325,000. 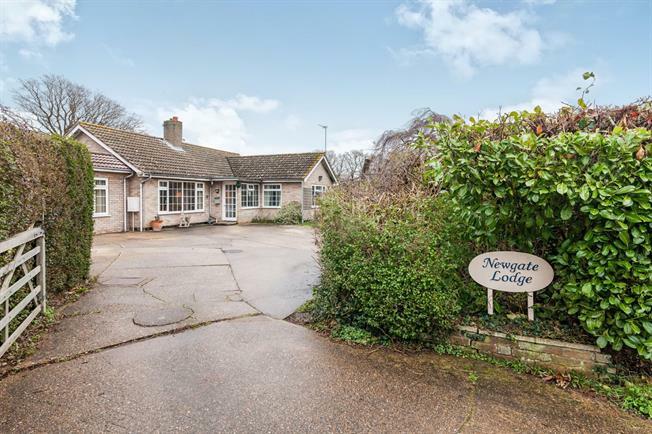 Generous proportions within a desirable semi-rural village with endless potential Perfectly positioned within a generous plot, Newgate Lodge is privately tucked away beyond a private road offering the new owner endless space and a wide array of opportunities given the potential the current layout offers. Leading through a welcoming entrance porch, the generous hallway gives you the first insight to the proportions the bungalow offers. Three of the double bedrooms lead from here in addition to the family bathroom. Leading through the breakfast room, this is then open plan to the kitchen which offers enviable views over the rear garden which overlooks the neighbouring fields. A utility room and shower room leads to the side, essential for the semi-rural lifestyle. The dining room is another rear aspect room soaking up the best of the views, this room pleasantly leads to the generous sitting room. The family room and master bedroom is situated to the side of the property, benefitting from its own private external entrance, this part of this substantial home lends itself to being converted to either a private annexe or space for those looking to run a small business from home (stp). Outside, the generous plot wraps around the bungalow and the driveway to the front allows parking for several vehicles.